The 5G PPP Technology Board organised a three day workshop with a focus on 5G performance KPIs. The organisation was supported by project 5GCAR and Ericsson Research that hosted the workshop at its headquarters in Kista, Sweden from 20-22 November 2018. Magnus Frodigh, acting head of Ericsson Research opened the workshop with an inspiring presentation of Ericsson’s current and future view on 5G. 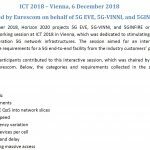 5G-VINNI – represented at the workshop by Kashif Mahmood from Telenor and Diego Lopez from Telefonica I+D – actively participated at the workshop. Kashif among others presented the 5G-VINNI testing, measurement and KPI validation framework, and the general approach to performance KPIs. The area of test, measurement and KPI validation is actively promoted by 5G-VINNI and 5G EVE that have been strongly advocating for the creation of a 5G PPP level work group on Test, Measurement and KPI Validation (TMV). During the workshop the Technology Board agreed the creation of the TMV WG. Anastasius Gavras, also a member of the 5G-VINNI team, is current chair of the 5G PPP TB ad hoc work group on performance KPIs. He introduced the work of the ad hoc work group and led the very interesting discussion that was triggered by each project’s individual approach to KPIs. The workshop was very useful and concluded with an agreed approach and structure on how to capture the projects’ KPIs and how to globally relate them to the KPIs of the 5G PPP initiative. The 5G PPP programme has high expectations on the outcome of the TMV WG and the ad hoc WG on performance KPIs, as contributions to the annual Programme Monitoring Report (PMR) with respect to quantifiable achievements towards the 5G PPP contractual performance KPIs.